December 12, 2018, 3:00 p.m.
Vlogging (video blogging) is a form of content creation where a person records their lives to educate, entertain, or share their opinions with others. The topics that vloggers discuss range from silly to serious, from beauty to tech, and Americans appear to be enchanted by the video genre. In a recent study, YouGov Omnibus discovers that over half (52%) of Americans say they watch a vlog and millennials (72%) are especially likely to be viewers. Two demographic factors appear to be correlated with one’s likelihood to watch vlogs: age and race. 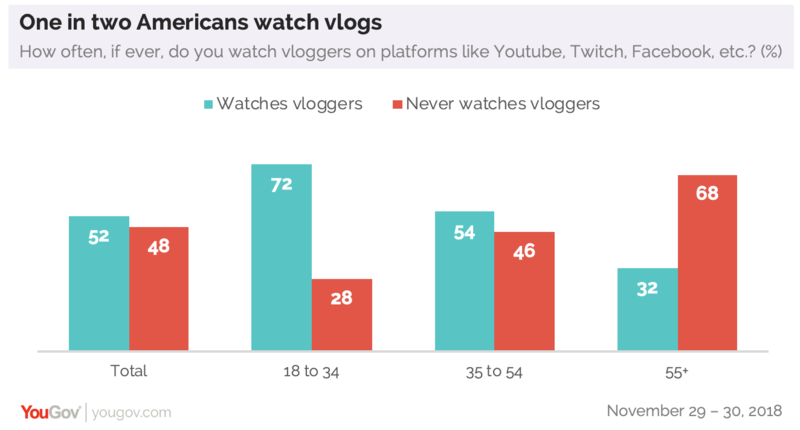 Americans aged 18 to 34 may be the most likely to watch vlogs but over half (52%) of 35 to 54 year-olds are also viewers. Notably, close to a third (32%) of Americans aged 55 and over say they watch vloggers. The study also shows black Americans (61%) are especially likely to watch vlogs, leading in viewership compared to Hispanics (57%) and whites (48%). The presence of children around the house may also play a factor: parents (62%) are more likely than non-parents (48%) to say they watch vlogs. Vlogs also cover a variety of subject matters. 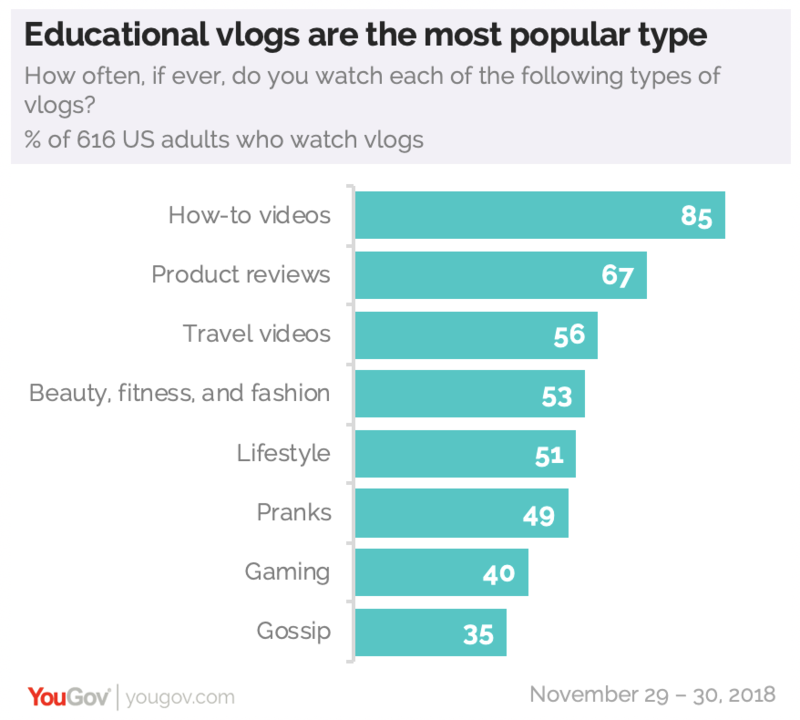 Educational vlogs in the form of how-to videos (85%) and product reviews (67%) tend to be the most popular among watchers. More than half also say they watch vlogs that discuss travel (56%), beauty and fitness (53%), and lifestyle (51%). Along with watching a diversity of vlog types, the vlogging audience regularly watches more than one vlogger. Among those who watch vlogs at least once a week, just one in five say they watch a single vlogger on average. More are likely to flit between two (24%) or three (28%) vloggers and some (20%) even say they watch five or more different vloggers. 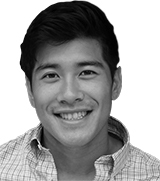 Viewed from a consumer angle, vlogs can help inform some purchase decisions. Among those who watch vlogs at least once a week, 44% say they ‘often’ or ‘almost always’ search for a product online or offline after seeing it on a vlog. And nearly a quarter (23%) of the same group report they buy the product ‘often’ or ‘almost always’ after seeing it on a vlog. Not all vlogs are made to be helpful though. When asked about clickbait – the act of using a misleading title and/or image to get the viewer to click on a video – 69% of vlog watchers say they have been duped into clicking a video that fell short of what they were expecting. 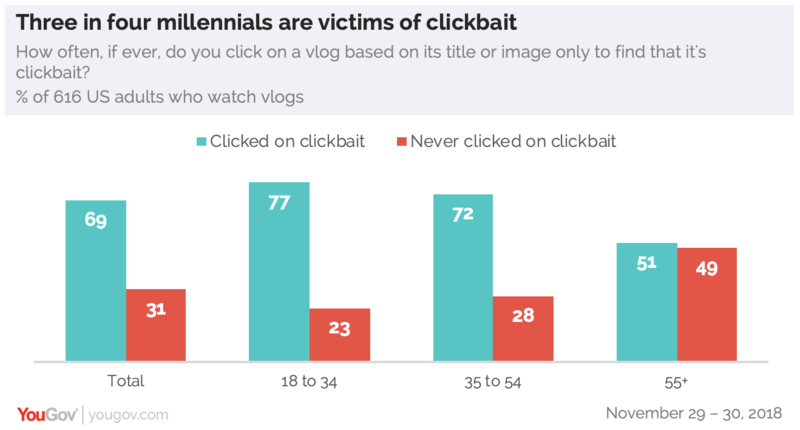 Millennials seem particularly susceptible to clickbait videos and 77% say they’ve been clickbaited.